TORONTO - When Masai Ujiri was interviewing for the job of Raptors' president and general manager he made three requests of hiring manager Tim Leiweke before officially getting the gig. "I told him I wanted to choose my staff and I asked if there was a possibility for a D-League team and a practice facility," Ujiri recalled. "I thought those were the three [important] things and he came through for us on [all] three of them." After months of speculation, crossing their fingers and holding their collective breath, the Raptors were finally able to announce the acquisition of their own NBA Development League team, Raptors 905, which will be based out of the Hersey Centre in Mississauga, Ontario this coming season. It was a long time in the making and a coup for an organization that is hoping to hang its hat on player development in the years to come. For Ujiri, this was a priority from the moment he took his post atop Toronto's front office back in the summer of 2013. That was a full year before drafting Bruno Caboclo - the intriguing 19-year-old project that should spend a significant chunk of next season playing in Mississauga - but he always had players like the young Brazilian in mind when laying the groundwork for what ultimately became a reality Monday afternoon. Once they got the ball rolling it actually came together in a hurry. 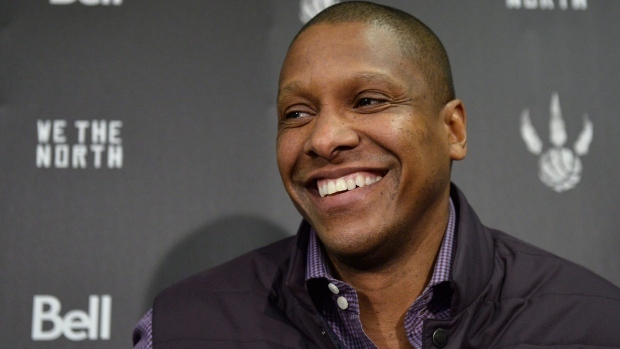 Ujiri and his front office team met with D-League management in New York during February's All-Star weekend. The Raptors had been exploring various locations that could house a minor league franchise, including Rochester and Buffalo. When they pitched a local, Toronto-based D-League club, which would become the first in Canada, the reception was positive, though there were obstacles that had to be overcome. "When we came up with this idea everybody jumped on it," Ujiri said after unveiling the Raptors 905 logo. "There are lots of issues you have to tackle and lots of things that come into play. Up until two days ago there were issues that needed to be solved and if not it was not going to get done." Most of those issues pertained to business end of things. "A couple of the biggest ones were, what Masai touched on, was understanding the immigration and tax issues of actually getting the team out here," said Bobby Webster, Raptors VP of basketball management and strategy, one of the driving forces in this process. "The other big thing was getting the lease done here at the arena. And obviously there is a business side to the team so you want to make sure the team is set up so that it can be sustainable at some point." "We were up against a pretty hard deadline. So I would say there were moments where we were wondering if it was going to get done or not. So it wasn't all smooth sailing." Toronto is the ninth NBA team to own and operate its own D-League club, having shared the Fort Wayne Mad Ants with 12 other big league teams last season, magnifying the need to purchase a single affiliate sooner rather than later. In two stints with the Mad Ants, the rookie Caboclo logged just nine minutes per game, appearing in seven contests and spending another two glued to the bench. Understandably, the team was reluctant to send him and fellow first-year player Lucas Nogueira down only to lose control of what they were learning and who they were learning from. This year, for Raptors 905, the priority will be development, first and foremost. Their proximity to the Air Canada Centre - Mississauga is located 20 miles from downtown Toronto - allows Ujiri, Dwane Casey and company to be creative with their management of the new team. "It helps us develop players, I think that's number one, but we're also going to use this an experiment," Ujiri said. "We're going to use this as a guinea pig in some ways, whether it's modelling our front office or modelling what the coaches are doing, instructing, teaching. We're going to try everything. We're going to try new things that might not work but it's going to be good for us in the future to find out things that we can try here that might not work on the senior team. I think that's one of the biggest benefits for us." "One of our NBA guys could practice with us in the morning, come play a game here at night and then go back to sleep in his own bed," Webster added. "And then secondarily, we'll be able to come and watch all these games. So all of our scouts, we'll have a close eye on monitoring not only our players but the D-League players as well." The Raptors will be able to send as many as two players from their 15-man roster to the D-League club at any given time, with those players remaining on the NBA team's roster for as long as they're on assignment (there's no minimum or maximum time per assignment). They'll also have an allocated number of spots they can fill with non-roster players under their control; their recent second-round selections - DeAndre Daniels (last year) and Normal Powell (this year) are candidates to spend this coming season in Mississauga if they're willing to sign one-year D-League contracts. The rest of the D-League roster will be filled through a league dispersal draft and players they sign or trade for. You can also expect at least a few Canadian-born players to make their way onto the team. Now that Raptors 905 is in place, and set to begin their inaugural season in November, the next order of business is hiring a head coach and staff. The process is already underway, with Toronto looking at candidates internally and outside the organization, intending to have someone in place by the time Summer League opens in Las Vegas on July 10. Whoever is hired will work closely with Casey and his staff in the hopes of emulating their sets.